The busy holiday season sees a drastic drop-off in the numbers of races in the Crescent City; however, the few races that are taking place are some of my favorites. Trust me when I tell you that upcoming events give ample reason to pull out long-sleeved tech shirts, ear warmers, throwaway sweatshirts, and ChapStick. For the love of everything that is holy in running, don't forget the ChapStick. Personally, I'm going to tackle the BRB full marathon at the beginning of the month followed by the Ole Man River Half a week later. Both events I do my best not to miss each year, as both were my introduction to distance running. Then, as Christmas approaches, I'll scale back to prepare for a January that's sure to put my legs to the test. In the meantime, I encourage you to give yourself or your family an early holiday present. Sign up for one of these events. I promise it won't be something you regret. Baton Rouge Beach Marathon / Half Marathon (Saturday, December 7th @ 7:00am) - Its the 20th anniversary of this race, and the 5th anniversary of my first full marathon. I've run the double loop course through LSU's campus and around the lakes several times. It's a small but well organized race with awesome post-run food (did someone say alligator?). I'll post more about this race and my 5th year running next week. Freret 5k / Half-Mile (Saturday, December 7th @ 8am) - Hosted by the Junior League of New Orleans, this first year race takes runners up and down the bustling Uptown Freret Street corridor. Women's Half Marathon / 10K / 5K (Sunday, December 8th @ 7:00am) - In only its second year, this Baton Rouge event has emerged as Louisiana's premiere women's only endurance road race. Their Facebook page highlights the great medal, tote bag, and other benefits for women participating. Celebration in the Oaks Run / Walk (Saturday, December 7th @ 3:30pm) - This 2-mile fun run is a great family event that is stroller and child friendly. Post race access to the Celebration in the Oaks light display in City Park is an added perk, as it is open to race participants before the general public. Be on the lookout for Santa for a pre-race photo! 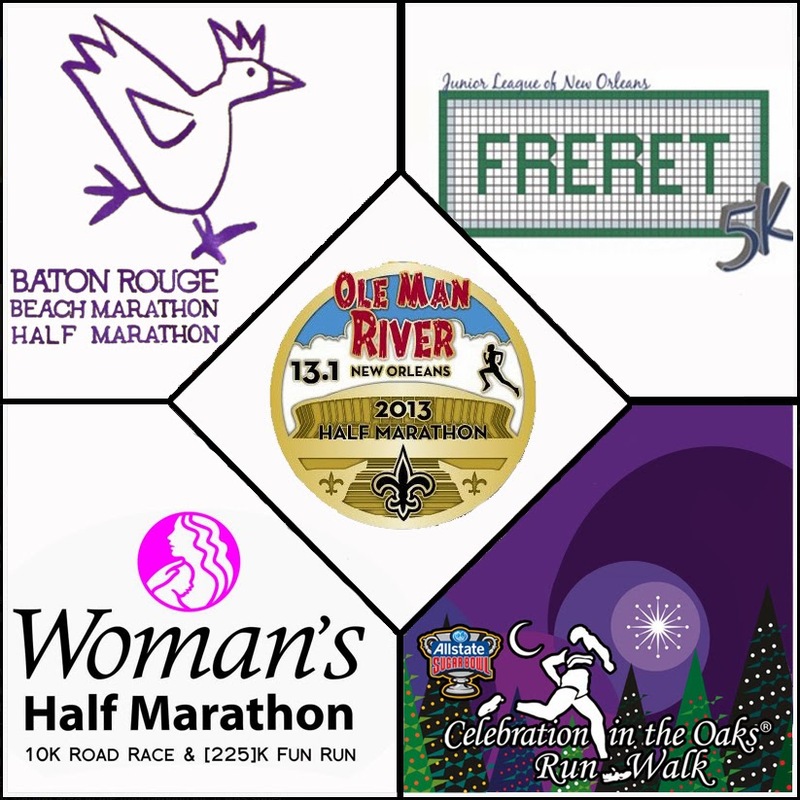 Ole Man River Half Marathon / 5K (Saturday, December 14th @ 8:00am) - You won't even notice that the closest "river" this race touches is Bayou St. John. The New Orleans Track Club hosts a great event year after year with this race, and the handsome finishers' medal for half marathon runners is uniquely New Orleans. Festival of the Bonfires 5K / Half-Mile (Sunday, December 15th @ 8:30am) - Celebrate the lighting of the bonfires along the Mississippi River levee with this racing tradition. Registration includes entrance into the festival.